Fast Delivery We understand the importance of fast delivery and our dedicated staff will do everything possible to get your Maplestory M Mesos order as soon as possible. Best Price We offer the product you want at the price you deserve. 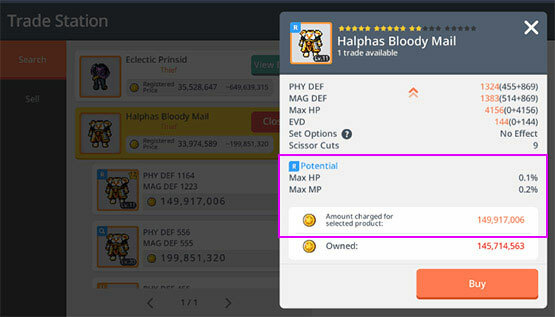 We pledge to offer you the best service and best Maplestory M Mesos product at the best prices! 2. Choose an item to sell. Please set a special price, for example, for 10,000K, please set like 10,000,432 or 10,000,433 in order to avoid the same item and price with others. 3. Your item will show up in trade station within half an hour, once it shows up, please take a screenshot and offer it to us via email. 4. Our team will check and buy your item asap once we get the information from you, any question feel free to contact us via live chat, our customer service is 24/7 online. * We don't cover the Trade Station fee. MapleStory M is the same as the other games, and if you want to enjoy the game better, then you need enough Mesos. 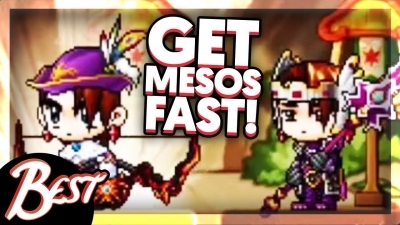 Mesos is the currency in the MapleStory M that can be used to strengthen your weapons and armor. Mesos can be obtained in the game in various ways. If you don't want to spend any time to make Mesos, the quickest and best way to get Mesos is to buy US, EU, AS server Mesos from U4gm. U4gm is a trustworthy seller. We do our best to provide the best service with the game so that you can enjoy MapleStory M thoroughly. U4gm, which has earned a 9.6 user rating on Trustpilot. Click U4gm Trustpilot to check its reputation. There are a large number of positive reviews shows that U4gm service is excellent. U4gm is well ­known for the high­ reputation among MapleStory M players. We sell Mesos is production by self, so we always sell at the lower price. We adjust Mesos prices in real time according to current market prices. That ensures you are buying at low prices on our site. You can also save money by ordering a significant amount of gold and using U4gm coupons. We know the essential about fast delivery for customers. By supporting all team here, U4gm could complete 91% of orders in 5 minutes. And for those orders with long time delay, we have a guarantee of refund - No delivery within 72 hours, a return will be unconditional. In MapleStory M 91% Orders completed less than 5 Mins, 6.4% orders achieved 5 - 30 Mins, 1.9% orders more than 30 Mins and 0.4% order are refund money. The data is real and reliable. Mesos are the in-game currency of MapleStory M, including the most basic and cheap bronze coin, then the gold coin, next to a bundle of cash, and then a sack of gold. It is used either to buy items from NPCs or to trade with other players. Mini Dungeons. You can farm approximately 150~200K Mesos for 30 minutes at Level 100. Which is a solid 400-800k Daily. Elite Dungeon: Grind till Level 95+, and perform daily Elite Dungeon. It will guarantee to reward an Epic Equipment. You can sell them for 400~500K Mesos in the trading section. Collect 350 Maple Leaves Daily: You gain free Mysterious Pouch Bags that rewards few 100K Mesos. All things Trade Station. There is some serious money to be made on the Trade Station by selling any items you don’t need. If you have any spare weapons or armor lying around, you can put them up in the Trade Station and wait for someone to buy it. 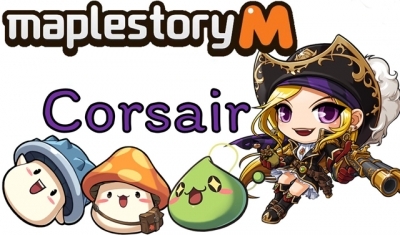 You can sell the item at any price, so if you’re really low on money, you can dump a heap of items and price them reasonably lower to get more sales in MapleStory M.
MapleStory M is a side-scrolling MMORPG, based on the MapleStory franchise. Play MapleStory M on your mobile devices & get ready to smash some Slimes! A world unlike any other. Welcome to MapleStory, the original side-scrolling MMORPG where epic adventure, action and good friends await you. With hundreds of hours of gameplay, this immersive role-playing experience will allow you to unleash your wild side as you create and train a mighty hero, conquer perilous dungeons, overcome terrifying bosses, socialize with your friends and much more. Your MapleStory begins today! Plunge into a legrndary quest. The sinister Black Mage and his minions have returned to terrorize Maple World after a defeat by six legendary heroes centuries ago. Now you are MapleStory’s only hope of eliminating the evil for good. Embark on a hero’s journey and become a champion capable of ridding the world of eternal darkness! Explore diverse enviroments. Traverse lush forests, arid deserts, frozen tundras, underwater kingdoms, lost civilizations and even a city in the sky! 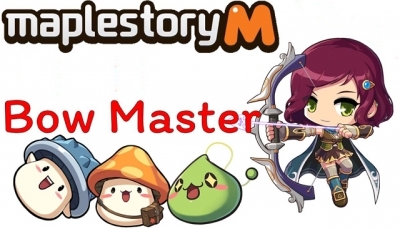 With hundreds of locations to visit and dozens of dungeons to master, MapleStory offers a wealth of gameplay for players to experience. Forge your mighty hero. Create a gaming experience as unique as your personality by designing your own MapleStory hero. With over 20 unique classes to choose from, as well as an almost limitless number of cosmetic options, your hero will truly become one-of-a-kind. Free-to-Play. MapleStory is completely free-to-play. Start today, and you can be a Mapler for years to come without any obligation to spend money. How to Easy Make 150M-200M Mesos? This method is very well documented and should be known by most players by now, boring. However, this is still the recommended method for new f2p players to gain their first pot of gold. Command your crew to fight for you! Corsairs summon NPCs (Non-playable characters) to fight for you. Fight from afar with your trusty gun. Pirate is a class that uses MAGIC as their primary form of attack and damage. Destroy your enemies from afar. With Bowmasters, players have lower Health Points and Defense compared to other jobs, but benefit from their high damaging moves at range. 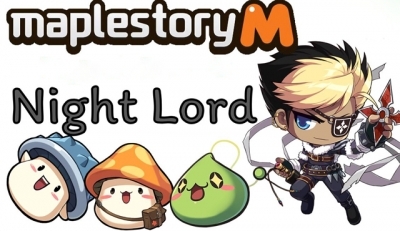 The Night Lord is the overpowered mess of a class nexon the greedy moronic company loves having unbalanced like the trash they are, of the five other jobs, which are Bishop, Bowmaster, Corsair and Dark Knight. Assassins by heart, Night Lords rely on their quick maneuvering and higher chance to land critical attacks.